Jerusalem, Israel — November 25, 2018 … Israel Prime Minister Benjamin Netanyahu and his wife Sara, welcomed the President of Chad Idriss Debyat at the Prime Minister’s Residence in Jerusalem this evening. It marked an historic, unprecedented trip for the leader of the Muslim-majority nation in Central Africa, which does not have diplomatic relations with the Jewish state. “President Déby and I had the opportunity to discuss the relations between our two countries and the way we can cooperate for the benefit of our peoples and for peace and for security,” said Prime Minister Netanyahu at the start of their first meeting. During his time in Israel Deby is expected to meet with Israel President Reuven Rivlin and Prime Minister Netanyahu for further talks. Last year WJC CEO Robert Singer held talks with Chadian Ambassadors in Geneva and Paris, at the time urging the reinstatement of diplomatic relations between Chad and Israel. The Republic of Chad cut diplomatic ties with Jerusalem in 1972. Some 13.5 million people live in Chad today, 55 percent of whom are Muslim. About 40 percent are Christian. Netanyahu has traveled three times to Africa in the last two years, visiting Kenya, Rwanda, Ethiopia, Uganda and Liberia. Netanyahu constantly vows to expand ties with all countries on the continent, including those that do not have diplomatic relations with Israel. Israel is working to establish diplomatic ties with a number of central African nations, including Sudan. 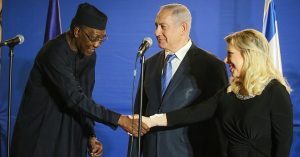 A senior Israeli official told the Israel News Agency that Déby’s visit was laying the groundwork for normalizing ties with Muslim-majority countries Sudan, Mali and Niger.